Nearly 100 bodies of black boys and men who were likely worked to death by the State of Texas were discovered outside of Houston. This system continued well into the 20th century and only ended when a reporter for the San Antonio Express began writing a series of articles exposing this horrific practice of state slavery. After the exposé on the convict lease system, the government ended all the leases and brought the black men back to the prisons where they were unfortunately still forced to work on state-owned farms, or on private property the state had acquired through long term agreements. These state run mass graves are not unique to Texas either. 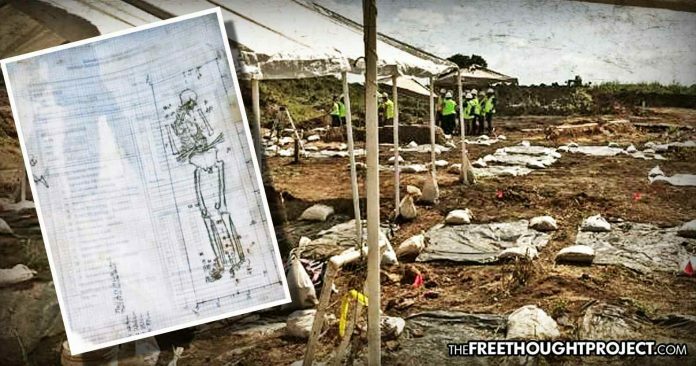 As TFTP reported last year, thousands of bodies were discovered, buried under the University of Mississippi Medical Center (UMMC) campus. The bodies are a result of a decades-long program in a failed government institution to deal with people the state declared mentally unfit for society — including depression, those who read books, “laziness,” the “over study of religion,” and “political excitement,” to name a few.